“Americans produce every agricultural commodity they consume and export it to other nations. Please note only 4% Americans are farmers. On the contrary 75% Indians are farmers yet we import many agricultural products. Why? Our farmers are poor and commit suicide. To solve the problem I found the solution in goat farming. Goats are mobile ATM. It will give instant cash when the farmer is in need of money because in our country demand for mutton exceeds the supply. On an average in our country mutton consumption is estimated as 20 kg/month/person. It implies goat farming has huge potential in our country and farmers can have their hands full of money,” highlights Mr. Imamsab Nadaf, progressive goat farmer. 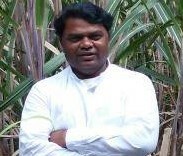 His 35 acre farm is located at Antargangi village, Sindagi Taluk, Bijapur district, Karnataka. He started his goat farm with 19 does (female goats) and 1 buck (male goat) in the year 2012. It is an exclusive ‘Osmanabadi’ breed goat farm. “Just in one year the herd size in my farm became 240 from 20. That is the remarkable feature of this breed of delivering 2-4 kids in one year. It is best suitable for dry land areas having hot climate. As the temperature level is soaring high every year due to global warming Osmanabadi breed is the best choice amongst the 24 different goat breeds available in India,” he asserts. The breeding stock was sourced locally but nurtured with self-prepared rearing and breeding program of Mr. Nadaf. “Soon after graduation, I went abroad for work. I extensively travelled to 16 countries and in my last job in Kuwait my salary was Rs. 1.5 lakh/month plus all perks. One day while in office I thought, why I am working for 13-14 hours? Who is the beneficiary of this hard work? Answer was ‘Arabs will be benefitted.’ Immediate second thought was why not I work for my country, my people and my soil? Within next 15 days I resigned and came back home in 2009. With all the savings I bought 35 acre farmland in my village. I tried almost all possible crops be it vegetables, grains, pulses etc. The production was satisfactory but the net profit was marginal. Besides farmers in Bijapur district were depressed and were committing suicide. It once again set me to think as what is the solution. Then I realized most of the enlightened souls like Jesus Christ, Mohammed Prophet used to rear goats so it certainly is extraordinary venture! I did extensive research on goat farming and found it to be indeed profitable business thus became goat farmer in 2012,” Mr. Nadaf describes the drive to set up the goat farm. Within the first year itself Mr. Nadaf earned good profits and started recommending goat farming to other farmers. 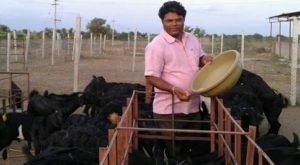 He provided free-of-cost training at his farm to farmers on rearing goats with the intention to enable farmer earn better and put a forever stop to suicides. So far he has trained 650+ farmers and farming enthusiasts. “My training sessions are practical oriented so that farmers can apply the learning on the field,” he affirms. Osmanabadi goats feed primarily on dry fodder precisely 70% while remaining 30% is green fodder. Dry fodder comprises of dust of pulses, sorghum and groundnut. Green fodder includes subabul leaves, hedge lucerne or even hydroponically grown greens. Green fodder is grown in-house while dry fodder is sourced locally. Quantity of concentrate to be fed to the goat varies as per its health conditions and age. Kid upto one month should be given 50-80 gram, upto 4 month 100 gram/day, normal adult female goat 150 gram/day, pregnant goat 200 gram/day, after delivery 250-300 gram/day. “Lastly the breeding buck must be given 500 gram/day concentrate without fail.” Life duration of goat is maximum 10 years. After 4 months it is considered as an adult. In 24 hours water intake of goat is 1-2 litre/day. It doesn’t require much water. Standardized vaccination schedule is must for the goats. It includes 5-6 vaccination and de-worming once in three months. “We maintain best hygienic conditions in the farm so disease breakout is almost negligible,” he highlights. Goat can deliver kids 15-16 times in its total life cycle of 8-10 years. It delivers twice in a year. Osmanabadi goat is the breed having high prospects of giving twin kids in each delivery period. Usually doe become pregnant after 6 months age. Buck can be used for breeding after 11 months age. Goats can be sold easily in the local market. “With more than five years in the business I receive farmers on the farm for buying goat kids and also buyers for buying adult goats. In addition, if in some need of cash I take the goats to the local market on Sunday and sell. There is no problem at all in selling goats as buyers are more than sellers,” asserts Mr. Nadaf. When asked about the price of the goat he says, “Unfortunately price is never fixed and it is under the hammer of bargains. I have suggested the government authorities many times to fix the price as per the weight of the goat but it is still sold as per animal. Selling price per goat depends on its age, gender and health conditions. A pregnant goat is sold for Rs. 20 thousand or more, 4 months old male goat for cutting at Rs. 3-4 thousand, 6-7 months old male goat for cutting at Rs. 5-7 thousand if its health condition is good.